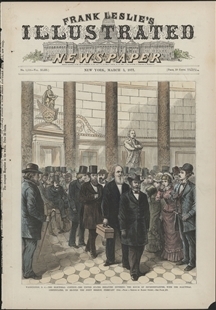 The process of resolving the disputed 1876 presidential election is illustrated in this wood engraving. Florida was one of four states that sent two sets of inconsistent returns to Congress. David Dudley Field, who served a single term in Congress, objects to Florida’s returns in a packed Chamber. 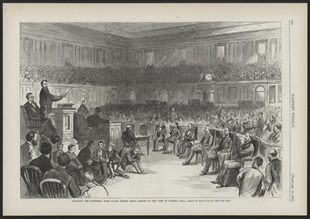 The newly formed Electoral Commission is seated facing the rostrum, which is populated not only by the usual officials, but also a group of exhausted and distracted Pages.